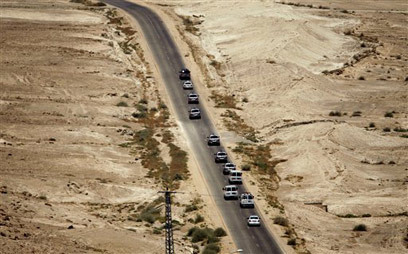 A group of gunmen affiliated with Fatah attempted to hit Prime Minister Ehud Olmert's convoy as it made its way from Jerusalem to Jericho for a meeting with Palestinian President Mahmoud Abbas on August 6, Shin Bet chief Yuval Diskin told the cabinet ministers Sunday morning. Israel learned of the plan from intelligence information received several days before the visit. The attack was eventually thwarted by the Shin Bet and the Palestinian Intelligence Service headed by Tawfik Tirawi. Following the incident, the Palestinians arrested three suspects, who were later released, according to Israeli officials. Two other cell members are being held in Israel. On Sunday, Israel filed an official complaint with the Palestinian Authority following the suspects' release. Israeli security sources expressed their anger over the release, which took place "after these terrorists' involvement in the foiled attack was made clear." Palestinian Prime Minister Salam Fayyad confirmed Sunday afternoon that the PA arrested a number of suspects after receiving intelligence information from Israel, but that they were released due to lack of evidence. "We are studying the incident and plan to do our best to restore the order in the region," Fayyad said at the start of a meeting with Knesset Speaker Dalia Itzik at Jerusalem's King David Hotel. "We will draw all the possible lessons so that a similar incident does not repeat itself in the future." The meeting between Fayyad and Itzik was originally scheduled to take place in Jericho. Itzik explained why she decided to go ahead with the meeting after consulting the Shin Bet. "There are elements who are trying to sabotage the diplomatic process. This is not something new. We believe that the Palestinian prime minister and Abu-Mazen (Palestinian President Mahmoud Abbas) and the group of moderates in the PA wish to advance a process with the State of Israel. Therefore, despite the severe incident we were informed about this morning, we shall go ahead with our meeting." The Knesset speaker added that "the prime minister himself decided to continue with the talks. We must not halt the talks due to the incident, although I view it as extremely severe, and I imagine that the State of Israel will demand an explanation." Olmert's visit to Jericho on August 6 marked the first official visit in seven years by an Israeli prime minister to the Palestinian Authority. "I feel great discomfort over the Palestinian pattern of behavior in this case," Prime Minister Olmert said Sunday before leaving on an official visit to Europe. "We shall not ignore this. The inappropriate way in which the suspects were handled is part of a pattern which must change." The prime minister made it clear, however, that he was determined to continue the negotiations with the Palestinians and had no intention of cancelling his participation in the Annapolis peace conference. Shortly after the initial report on the foiled attack, Ynet learned that the plot to assassinate Olmert was originally planned for June 6, when the prime minister was first scheduled to meet with the Palestinian president in the PA territories. The cell included five members who were involved in terror attacks and previous failed attacks in the West Bank. The information was disclosed to the PA, which arrested three of the cell members. The other two were detained by the IDF and the Shin Bet. Israeli officials claimed Sunday that the PA released the three suspects, whom Israel claims are members of the Palestinian security organizations, on September 26. The three, Ynet was told, admitted to the plot before they were released. "We view the assassination attempt as extremely severe," Foreign Minister Tzipi Livni said during Sunday's cabinet meeting. "We have made this clear both to (US Secretary of State) Condoleezza Rice and to the Palestinians." Internal Security Minister Avi Dichter was not surprised by the incident. "The plot to assassinate the prime minister is a classic example of the Palestinian Authority's 'so-called' policy of fighting terror. The Palestinians arrested Fatah members who were questioned and admitted that they had planned to target the Israeli prime minister, but released them anyway," he said. Shas officials praised the Shin Bet for thwarting the attack. "We have received more proof that the Annapolis conference should be turned into an economic meeting. With such a temporary feeling of security we cannot advance on the diplomatic channel," they said. "A thousand workplaces are worth more than a thousand guns. Workplaces will create security, compared to guns which will stress the lack of security." Right-wing politicians said that "the moderate leader" Abbas revealed his true colors. The Yesha Council responded, "The release of Fatah terrorist who attempted to assassinate the prime minister from the Palestinian prison, shortly after their arrest, proves that Abu-Mazen (Abbas) is implementing the 'revolving door' policy in the PA, which leads to arrest of murderers and terrorists for several days, followed by their release and return to terrorism. "It has once again been proven that Abu-Mazen is Abu-bluff. Letting him control the Judea and Samaria hills is like handing over the territory to Hamas. This will blow up in our faces." "We view with severity the fact that the Palestinian Authority released the cell members it had arrested," a source in the Prime Minister's Office said Sunday morning. A Palestinian security source told Ynet that as far as he knew, the plot did not develop into a real assassination attempt. "These were at the most talks by an activist or a group of activists," he said. The same source noted that the territory was under full Israeli security control, and therefore the Israelis did not need the Palestinians in order to arrest the cell members. The Israelis detain people in Jericho almost every week, the source added. The incident did not disrupt the Olmert-Abbas summit in Jericho, as well as the meeting which followed. Although the incident was kept a secret until now, it appears to have prevented additional visits to Jericho by Israeli officials. Israel's claims that the PA released the terrorists involved in the assassination attempt may now harm the relationship between the two sides ahead of the US-sponsored Mideast peace conference. Members of Shas and right-wing parties called on Olmert to reconsider taking part in the Annapolis conference following the incident. See all talkbacks "Olmert escapes terror attack in Jericho"